Dubai, U.A.E. : SOUQ.com, the largest online marketplace platform in the region today announced its investment in InstaShop, a hyperlocal online grocery ordering app. Through this investment SOUQ.com has taken a significant stake in the company as a strategic investor with a view to further expand its offering in the fast growing FMCG and Grocery categories, leveraging on its current user base. The investment comes at a time when grocery shopping online is experiencing a significant global uptake – investment banking firm Morgan Stanley, estimate an increase in grocery shoppers buying online from 21% in 2015 to 34% in 2016. 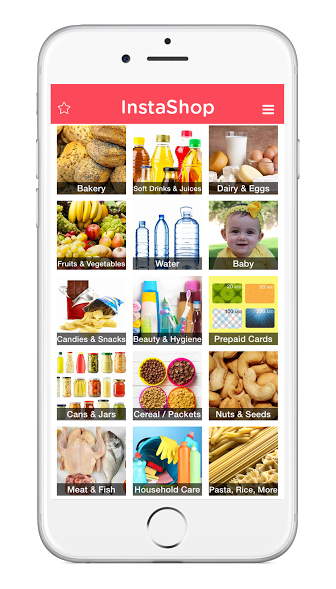 Capitalizing on the growing need for convenient grocery shopping options, InstaShop has been made available through both Android and iOS, allowing customers to have groceries delivered to their doorstep in as fast as 30 minutes. Users of the app simply choose their products, select their delivery location and pay either via credit card or choose the cash on delivery option. The investment in InstaShop comes shortly after SOUQ.com recently announced investments in Wing.ae and helpbit.com. These new partnerships form part of its drive to support SMEs in the region as well as to create an integrated network to provide a world-class online shopping, delivery and after sale service experience for customers. The fast growing InstaShop platform wants to grant their customers with the gift of time, as it allows them to spend time on more productive and rewarding activities. The 5-minute online grocery shopping task vs. traditional way of shopping is becoming increasingly popular as millennials are extremely busy and prefer the convenience of ordering their groceries online, as they can perform this errand from the comfort of their home or on the go. SOUQ.com is the largest online retail and marketplace platform in the Arab world, featuring more than 1.5 million products across 31 categories such as consumer electronics, fashion, health and beauty, household goods, and baby. Today, SOUQ.com attracts over 45 million visits per month, with localized operations in the KSA, UAE and Egypt. InstaShop is the leading startup in the on demand grocery delivery market in the UAE. The platform allows users to access their nearby supermarket directly through their mobile app and shop for groceries with delivery straight to their door in 30 to 60 minutes depending on location. Founded in Dubai in June 2015, InstaShop has quickly scaled and has partnered with over 50 local supermarkets and chains. With more than 60.000 users, InstaShop is fulfilling tens of thousands of orders shaping the UAE grocery delivery market and getting acknowledged as one of the most promising UAE startups by Forbes Middle East in 2016.